Certainly you remember some creations from Han, that were shown here at TBs before. 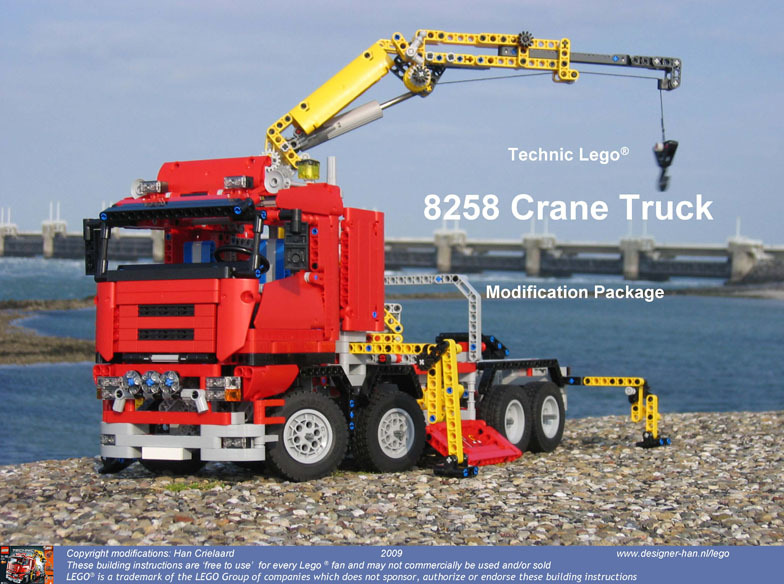 Recently he has been working on some modifications to this year Technic flagship, the 8258 (Crane Truck). A very nice model with magnificent construction details on its own, but according to Han there are some possible and easy to apply improvements. The first modification package consists of 8 small changes. CRITICAL: many customers noticed that the original set sometimes 'crunches' the 12th tooth bevel gear nearby the XL motor drive-shaft. This can be solved by applying ALL these critical modifications. - Add 24th tooth clutch-gear on 1st crane arm section. - Relocation of the 24th tooth clutch-gear of the 2nd crane arm section. - Prevent ‘walking axles’ for each 12th tooth bevel gear within each PF-LA bracket. IMPROVED PLAYABILITY: modifications who will contribute to a more effective usage of the technic functions. - Reverse movement of the outriggers; to avoid a motor direction switch. - Extra clarification to assure precisely ‘in-line’ steering of 1st and 2nd wheels. - Correction of lifting eye of extendable crane arm. - Correction of last wheel axle length. - Apply short axles (3L) to the steered wheels. All these are functional or 'cosmetic' modifications, perfectly integrated with the model, while not entering into details that would definitely change the original look from this truck. Included with the second modification package you may find instructions (in 41 steps), to apply so-called 'Twin Wheels' on the rear axles (3rd and 4th axle). These are added without compromising the rear functional outriggers and also make a very good addition to the original. 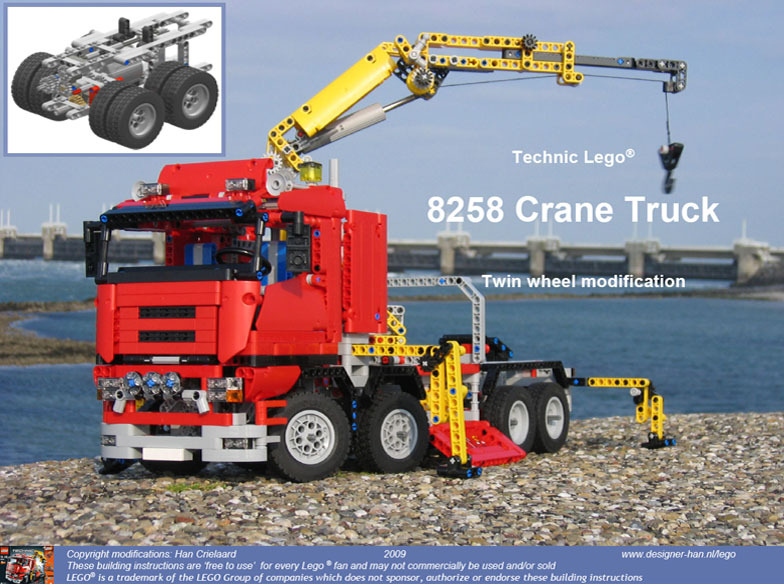 You may find all these and some more modifications to other official Technic sets from TLG, at Han's website here. Maybe you would be also interested to know, how does Han creates his stunning building instructions and take a read here. Test them yourself and tells us about your opinion! I'd like to take this opportunity to say a big "Thank You" to Han for putting in all the time and effort required to put these instructions together and share them with the community. They are very well done indeed, as is all his work.